Even a partial power failure couldn’t stop the University at Buffalo men’s basketball team. The winter storm that bore down on Western New York knocked out power to about half the lights inside of Alumni Arena, which caused halftime to be extended by an extra 20 minutes. It didn't bother the 18th-ranked Bulls, who came out hot to start the second half and scored an 83-59 victory over Ball State. UB rediscovered its accuracy after power slowly was restored to the arena. The Bulls shot 13-for-37 (35.1 percent) in the first half against the Cardinals – well below their clip of 46.3 percent prior to Tuesday – and a dismal 2 for 19 on 3-point attempts. UB coach Nate Oats met with the basketball team's trainer and strength coach at halftime and asked for a suggestion as to what the Bulls should do. "They'd gone out there and saw it was light enough to shoot, and they said, 'we should just go out there and shoot, and stay warm,' " Oats said. "As bad as we shot in the first half, let's try that! Let's get some extra shots up for 15 to 20 minutes, or however long it takes. "We just came out and shot, to see if the guys felt comfortable. I don't know if we shot any better in the second half, but we certainly weren't shooting it well (by) halftime." 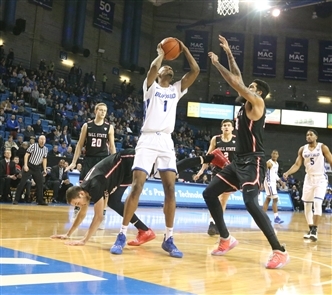 UB (19-2, 7-1) opened the second half 5 for 7 from the floor, and improved its shooting in the opening moments of the second half, to open a 13-point lead at halftime to 18. The Bulls finished 32 for 74 from the floor, including 7 for 31 on 3-pointers. UB moved a half-game ahead of Bowling Green (6-1) atop the Mid-American Conference. Senior Dontay Caruthers led the Bulls with 21 points and senior CJ Massinburg added 16 in front of 4,747 spectators. K.J. Walton led Ball State (11-10, 2-6) with 18 points. The Bulls earned their 21st straight win at Alumni Arena. The Bulls haven’t lost at home since Dec 2, 2017, a 73-62 Big 4 loss to St. Bonaventure. UB took an 11-4 lead about six minutes into the first half, but the early stages of the game moved at a slow pace. Ball State committed five turnovers in the first six minutes and went 1-for-5 from the floor. UB was 4 for 11 from the floor in that stretch. After Nick Perkins missed a pair of free throws at 5:34, Caruthers grabbed a defensive rebound and hit a layup that gave UB a 13-4 lead 36 seconds later. After a scoreless drought of 2:34 between the two teams, Davonta Jordan’s layup inside the 10-minute mark keyed the Bulls on an 8-0 run in the course of 2:11, to take a 21-8 lead against the Cardinals with 7:28 left in the first half. The Cardinals played with a short bench of three reserves after they lost center Trey Moses for the remainder of the first half to an apparent knee injury seven minutes into the game, yet cut UB’s lead to 23-17 with 4:29 left. But the Bulls closed the first half on a 12-5 run, which included Caruthers’ 3-pointer with 1:13 left, and opened the second half with a 35-22 lead. Back-to-back shots by Caruthers helped the Bulls open their lead to 46-28, and forced a shorthanded Ball State to call a timeout, less than five minutes into the second half. "I want to credit CJ, a lot, because he's the one who gave me a lot of my points, off assists and stuff like that," said Caruthers, whose 21 points were a season-high for him. "My team and my coaches were telling me to keep shooting, to stay aggressive. Caruthers, UB's defensive specialist, remained modest in light of his performance as a whole against the Cardinals. "As far as my performance, I think it was alright. I still could have done a bunch of things better. I only had three rebounds and I think I could have had a little bit more of that. I think our defense was okay, for the most part, but we gave up too many rebounds." Ball State had 48 rebounds to UB's 51. The Cardinals’ bench got shorter when Zach Gunn was called for his fifth foul with 13:46 left, then got even shorter when Walton took his fourth foul with 11:47 left, attempting to defend Montell McRae on a dunk. "We had six guys left that we could have put into the game," Ball State coach James Whitford said. "Other than checking myself in, we were getting close to getting down to four. It's kind of a tough deal with us. We're playing without Brachen Hazen. We're playing without Ishamel El-Amin. Now we're playing without Trey Moses. You take that, combined, and we go 2 for 23 behind the arc, not that Buffalo didn't have something to do with that, but we're not going to win playing at Buffalo, as good as they are, going 2 for 23 behind the arc." UB opened its lead from 50-36 to 60-38 with nine minutes left, and led by as many as 25 points in the final nine minutes. "I thought we defended well for a lot of the game, but eventually, we broke down in transition," Whitford said. "They have such relentlessness to them. "We've played Virginia Tech, we've played Purdue, we've played at Loyola (of Chicago and I'll say this: Buffalo's the most athletically gifted of those teams we've played, physically." Massinburg needed 27 seconds to eclipse the 1,700-point mark. Massinburg hit 1,701 career points on the Bulls’ first basket of the game. Massinburg then became UB’s fourth all-time leading scorer when he scored his 12th point on a 3-pointer less than a minute into the second half. Massinburg has 1,715 points in his four seasons at UB. The Dallas native moved past Mike Martinho in UB’s all-time scoring leaders; Martinho scored 1,708 points, from 1994-1998. Javon McCrea is UB’s all-time leading scorer with 2,004 points, ahead of Rasaun Young (1,908) and Jim Horne (1,833). UB's Nate Oats is one of 48 basketball coaches who are competing in the Infiniti "Timeout For the Win" Challenge. As of Thursday afternoon, Oats is in fourth place in voting, behind West Virginia’s Bob Huggins, Iowa State’s Steve Prohm and Arizona State’s Bobby Hurley. Of note: Oats succeeded Hurley as UB’s coach in 2015. Fans can vote for their favorite coach up to three times per day. The three coaches with the most votes will receive a portion of INFINITI's $600,000 donated in their name to the American Cancer Society. All participating coaches will have at least $1,000 donated in their name to the ACS. There are three ways to vote for Oats – on www.INFINITITIMEOUT.com or on Twitter and Instagram. Votes will only count once per day, per person, via each voting method. There are three required elements to post a social media vote: Fans should post a photo of themselves taking a basketball timeout while including the hashtags #TIMEOUTFTW and #CoachNateOats in the post. Voting will end at 9 a.m. March 11. 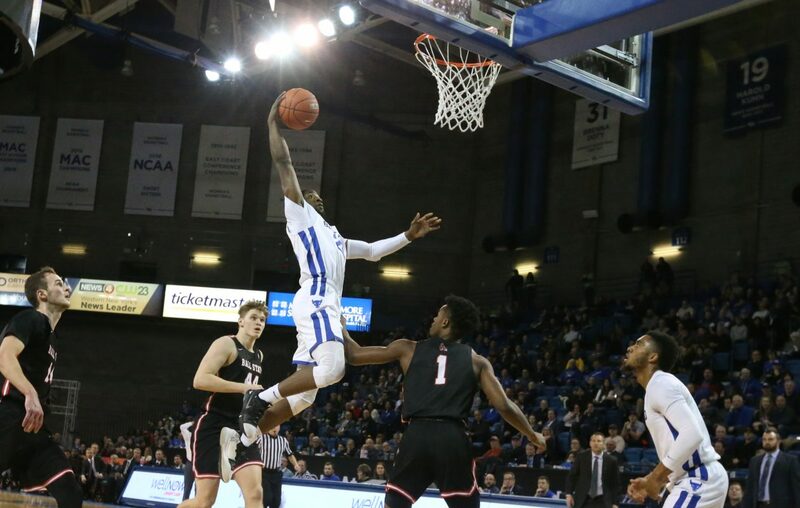 UB aims for its fourth NCAA Tournament appearance in five years, but March Madness – or at least its championship trophy – came to Alumni Arena on Tuesday. The two-foot tall, gold-plated and wooden trophy was on display in a rather understated manner in the concourse prior to UB’s game Tuesday against the Cardinals.